Remember the story back in October 2009 when a Texas Planned Parenthood clinic director quit her job and joined the pro-life cause? 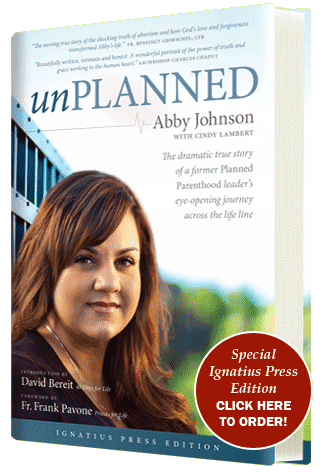 Her name is Abbey Johnson and after witnessing an ultrasound guided abortion procedure she left her career and joined the pro-life supporters who prayed outside the clinic she used to manage. Planned Parenthood sued her and placed an injunction to prevent her from revealing the "behind the scenes" of the abortion biz. The lawsuit was recently dropped and she is releasing her new tell-all book of her story and how Planned Parenthood distorts the truth in order to promote their abortion business model. The first chapter of her book details the event which precipitated her life-changing change of heart. I think it's a pretty gripping read...click here to buy.